Water is one of the essential resources on our planet. Therefore, fresh water and the recycling of waste-water are very important topics in various areas. Energy-saving green technologies are a demand in this area of research. they protect e.g. against incrustation of fouling matter, they are self-cleaning, antibacterial and viricidal. Therefore, they are attractive candidates for environmental applications such as water purification and waste-water treatment. photocatalysis with other technologies, and the proper design of photocatalytic reactors. 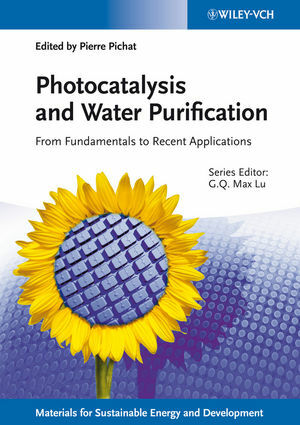 Implementation of applications and a chapter on design approaches for photocatalytic reactors round off the book. 'Photocatalysis and Water Purification' is part of the series on Materials for Sustainable Energy and Development edited by Prof. G.Q. Max Lu. The series covers advances in materials science and innovation for renewable energy, clean use of fossil energy, and greenhouse gas mitigation and associated environmental technologies. Professor Pierre Pichat is first class Research Director at the French National Center for Scientific Research (CNRS) in Lyon. He has been active in heterogeneous photocatalysis for more than three decades, and founded the laboratory of "Photocatalyse, Catalyse et Environment" at the Ecole Centrale de Lyon. He has published a great number of research papers and several review articles dealing with photocatalytic reactions and materials. At the "9th International Conference on TiO2 photocatalysis: fundamentals and applications", held in 2004 in San Diego, he received an Appreciation Award acknowledging his pioneering contributions; this award has been conferred to only three scientists in 20 years.